In hot mounting, the specimen is mounted under heat and pressure with a hot mounting press. Cold mounting is preferred for samples which are sensitive to damage from heat and pressure (like coatings, PCB, etc.) Cold mounting resins are easy to use and require mixing which is then poured into a mould and allowed to set. 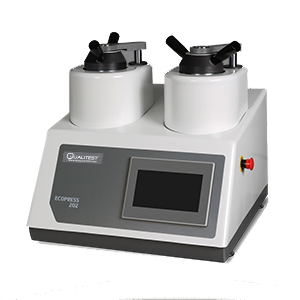 ECOPRESS Automatic Mounting Press for Sample Preparation, which is fully automatic and microprocessor-controlled.